When the poster for the final season of “Breaking Bad”—a black and white image of Walt with clenched fists, haloed in greenish light, the words “Remember my name” stamped across his face—was released in June, the Internet scrambled to interpret it. “Does the new ‘Breaking Bad’ poster foreshadow Walter White’s Death?” asked Flavorwire, citing Walt’s balled-up hands. “Walt is seemingly gearing up for a fight.” On The Atlantic Wire, Richard Lawson wrote: “Is the light heaven? Is Walter going to die?” One commenter on AMC’s website wondered whether the watch on Walt’s left hand could somehow be a form of foreshadowing. Welcome to the age of TV-poster public exegesis. TV culture has become so obsessive, so attuned to any sign of what’s to come, that even its off-screen manifestations are subject to exacting scrutiny. And over the past few years, AMC, Showtime, and HBO have become increasingly adept at milking the hype around their shows with poster art that can be endlessly parsed. Take the recent “Newsroom” season two poster, reliably packed with corny pathos, in which Will McAvoy and his team ponder the future of journalism in front of a single glowing TV screen in an empty field. Papers fly around Will’s head; a stray gust lifts his tie. “Together they stand alone,” declares luminous font on a black sky. 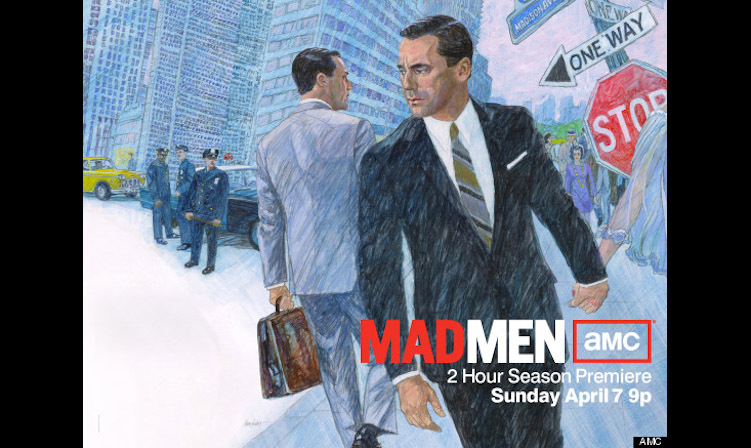 Then there was “Mad Men”’s season six poster, an elaborate illustration of Don Draper passing his own double on a crowded street, which stirred up much online speculation about Don’s fate. AMC sets out to make its posters “richly layered” and “a metaphor for what the season is going to be about,” Linda Schupack, AMC’s head of marketing, told me. As television has become more cinematic, TV posters have too. But it’s harder to summon a similar iconic image for a show like “Happy Days” or “All in the Family.” For years, advertising for TV shows was mainly done on television, since it was otherwise difficult to target relevant eyeballs in the way that movie theaters did for upcoming releases. When Entertainment Weekly launched in 1990, it offered the first major venue for colorful, full-page publicity shots. The first TV show posters, though, tended to be dully promotional. 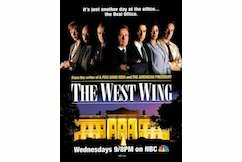 The 1999 poster for “The West Wing” could hardly be more straightforward: The cast members stand with their arms crossed, the White House beside them. Even the early “Sopranos” art was deceptively plain. Both the season one and season two posters feature Tony staring down the camera, his family arranged as neatly as a police line-up behind him. But by season five, the poster art had transformed to better suit the show. Annie Leibowitz shot an image so lovely and baroque that it almost defies description: there is a boat, there are bodies are strewn in the dirt, and Tony and his family are dressed in black against a flame-orange sky. Today, the literal-minded TV poster has given way to images that can seem loaded with innuendo. It’s a reflection of the massive investment in marketing designed to help TV shows “break through the clutter," as one executive told me. Zach Enterlin, executive vice president of marketing for HBO, described the poster for the most recent season of “Game of Thrones”—the ominous shadow of a dragon—as an image they were confident would stand out. “Today you’re much less frequently seeing the old-school TV poster,” Enterlin added, “where it looks like a PR shot of the cast, smiling directly at the camera, arm in arm.” And so today’s posters are often an attempt to capitalize on the culture of buzz by providing ample grist for the social media mill. There is a sense, says chief marketing officer for Showtime Don Buckley, that “fans are holding their breath” in anticipation of the release of each season’s poster. So the question becomes, “How do we capture that?” His masterwork—or at least his favorite—is the season eight poster for “Dexter” in which Dexter’s face is encased in plastic wrap to represent the way the walls are closing in on him. “I lose my breath as I pass it in the hallway,” he said. Historically, the poster teasing a series premiere tends to be less complicated than art for later seasons. But the very first “Breaking Bad” poster, released in 2008, was weird and mystifying; it featured Walt, pants-less in the desert with his green shirttail flapping, an R.V. burning in the background. 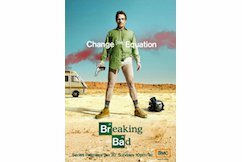 As the seasons progressed, Linda Schupack, head of marketing for AMC, and show creator Vince Gilligan wanted to "show the intensity of Walt’s transformation from Mr. Chip to Scarface.” In last year’s poster, Walt sat slumped in a lawn chair throne, his precarious empire towering behind him: the heaping stacks of meth and the piles of bills. Other shows approach poster design as a similarly involved creative process. 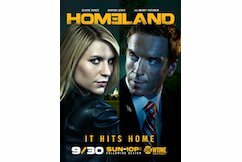 When Showtime’s Buckley sat down with producers and the marketing team to discuss the season two poster for “Homeland,” the goal was to hint at major plot developments: Brody was no longer in the Marine Core; he was in the halls of Congress. But the main focus was the twisted Brody-Carrie dynamic. On the final poster, Brody’s eyes are cast toward Carrie, but he seems to be looking through her. The Capitol building glows like a tiny chess piece in the distance. “Look at the details,” Buckley told me recently, with solemn pride. The Guardian ran a piece titled “Homeland Series Two: The Poster Decoded” that essentially analyzed the image pixel by pixel. But sometimes a poster is just a poster. In one "Homeland" image that was considered as key art but ultimately only ran as an ad in The New Yorker, Carrie pieces together a composite of Brody's face from paper scraps. "We expected that people would pore over the notes looking for clues," Buckley said. "But there were no clues there." The bits of paper were discarded props from filming Carrie's evidence wall. Last month, AMC released a simple poster for the final season of "Breaking Bad," a teaser before the more explicit black-and-white Walt portrait came out weeks later. It featured the words “All bad things must come to an end” on a smoky green background, stamped with the date August 11th. There is no AMC logo, no mention of “Breaking Bad,” only the subtle, iconographic arrangement of “Ba” as an element on a periodic table. "We can talk about the symbolism forever," one blogger wrote. "What does it mean?" Laura Bennett is a staff writer at The New Republic. Follow her @lbennett.